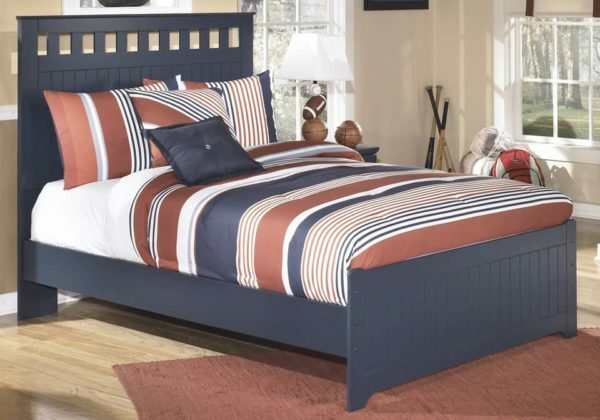 The Leo bed’s clean lines and handsome finish complement virtually every motif imaginable. Whether their new passion is dinosaurs, horses or cars, this bedroom furniture will be a mainstay. Replicated beadboard sides lend a traditional air. Replicated blue paint. Grooved panels and embossed bead framing drawers. Rolling trundle storage box enables the option of storage or bed. Side roller glides for smooth operating drawers. Twin (52) and full (87) headboards can attach to a bolt-on metal bed frame B100-21. B100-11, B100-12 roll slats can be used in substitution of a box spring on the twin or full panel beds.